On Georgia highways you often see trucks carrying intermodal freight containers that were delivered to southeastern ports from places around the world. 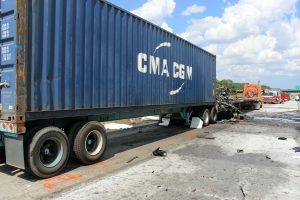 Attorneys preparing to take to trial cases of catastrophic trucking accidents involving intermodal freight need to understand issues that differ not only from regular highway accidents but also that from other trucking accidents. When freight containers are shipped by sea, rail and truck, that is called intermodal shipping. Throughout the country you see large intermodal freight facilities that transfer freight containers between ships, trains and trucks. In Georgia, vast amounts of container freight are handled through the port of Savannah. This week the Federal Motor Carrier Safety Adminstration began enforcing its Intermodal Chassis rule that requires intermodal equipment providers (IEPs), motor carriers and drivers to share responsibility for the safety of intermodal equipment used on U.S. highways. Intermodal equipment or chassis are the trailers used in the transfer of goods from a ship or rail car to trucks for final delivery. There has been a problem with old, poorly maintained trailer chassis being spray painted and put back into service hauling freight containers, with inadequate regard for safety. Now there are new rules requiring providers of intermodal chassis to implement systematic inspection, repair and maintenance programs, and repair or replace defective equipment. The chassis must now display uniform identifying numbers. For cases where the insurance coverage of a small motor carrier is inadequate to compensate a catastrophic injury, we also consider the potential to access the insurance coverage of the ocean carrier that is responsible to the shipper for delivery of freight all the way to the inland destination. When a container of freight is shipped from Shanghai or Rotterdam, the bill of lading is for shipment to the ultimate destination, not just to the port of Savannah or Charleston or Jacksonville. The ocean carrier than contracts the transportation of the freight container is responsible for the movement of the freight all the way to the inland destination, even though it contracts with another company to haul it by truck on the last leg of the trip. 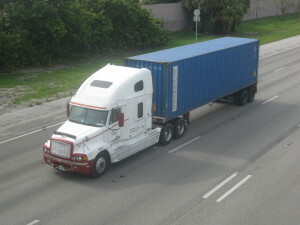 Under the definitions in the Federal Motor Carrier Safety Regulations, the ocean freight carrier qualifies as a motor carrier, and is subject to liability when the container shipment operations injures an innocent motorist on the highways of Georgia. It’s considerably more complicated than a regular road wreck, but the distinction can make a huge difference in the availability of adequate insurance coverage in a catastrophic case. Every time I make my way from Atlanta to Savannah, I enjoy watching the container ships cruising up the river past downtown. They are always stacked high with hundreds of huge freight containers. Thousands of those containers are unloaded from the ships onto truck trailers and trains at every major port to be transported across the country. Georgia highways are full of intermodal containers imported through the ports of Savannah, Jacksonville and Charleston. Often the trailers used in these intermodal operations are old chassis repainted to look good but poorly maintained. Too often the trailers that were loaded in Shanghai or Rotterdam contained unbalanced loads that ride fine on a ship but are dangerous in highway curves. Over the past several years there has been increasing concern about safety of intermodal freight operations. Now the Federal Motor Carrier Safety Administration has announced plans to add a fifth equipment marking option to its rules, allowing chassis to be identified through a system that uses technology to match equipment to the company responsible for its maintenance. They hope this will clear the way for industry efforts to launch a global registry for intermodal equipment. 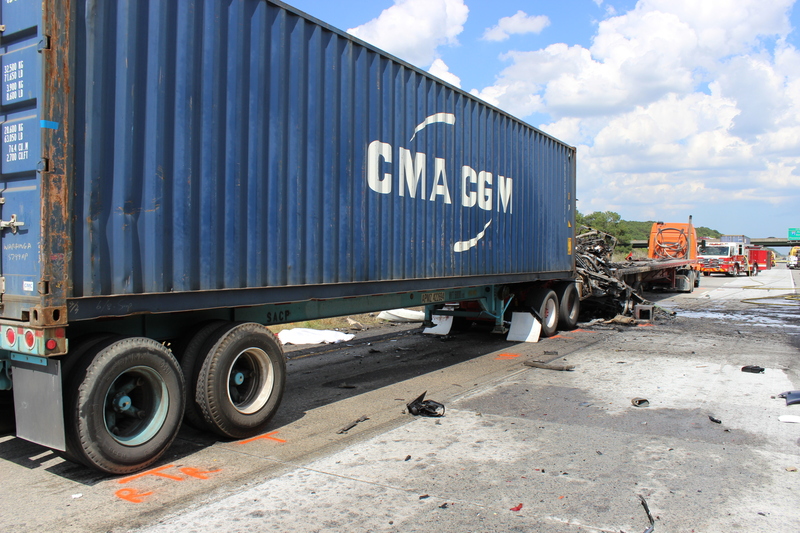 Of more immediate interest to families of people catastrophically injured in crashes of trucks hauling these freight containers is the difficulty of reaching the insurance coverage of the intermodal companies. Often the inland truck hauling is brokered to a small trucking company or owner-operator with only $750,000 to $1,000,000 liability coverage. That sounds like a lot, but when you’re looking at a $20,000,000 life care plan for a catastrophic injury, it’s a drop in the bucket. Courts in Georgia have had a hard time coming to terms with the totality of intermodal shipping, tending to look at just the tip end of the spear and not at who is throwing the spear. Last Friday, I spent a day in St. Louis at a seminar by David Nissenberg from San Diego, author of the book, Law of Commercial Trucking. He is a scholar of this area of law, and has painstakingly put together the legal theory to connect all the dots and reach the insurance policies of the ocean shipping companies that bring the containers into the US and load them on the trucks. In a tour de force, he combines international treaties, U. S. maritime laws and regulations, standard maritime bills of lading and other shipping documents, interlocking provisions of the Motor Carrier Act and Federal Motor Carrier Safety Regulations, Restatement of Torts, Restatement of Agency, etc. David hasn’t published a paper on this. There are no cases on point yet anywhere in the U.S. To persuade a judge who is busy, understaffed, and knows little about this area of the law, will require some masterful explanation. But when a catastrophic container freight trucking case comes along, we’re ready. This is a great lesson for those naive lawyers who think an commercial trucking accident is just a bigger car wreck.